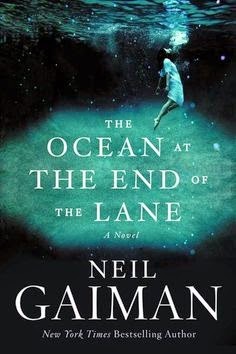 The Ocean at the End of the Lane by Neil Gaiman is a book about a boy’s childhood filled with paranormal activity—not the kind where a possessed person is watching you sleep, but the kind where three women have “unusual” talents for recipes (spells) and one other-worldly, evil being reeks havoc in all four of their lives, mainly the boy’s. When a man goes back to his hometown for a funeral, he starts to remember odd occurrences when he was seven years old, things he had forgotten and will later forget again. It all begins when he meets Lettie Hempstock, an eleven-year old at the end of the lane. Like in the movie The Little Girl Who Lives Down the Lane, a 1977 movie starring Jody Foster, strange things are happening there. Instead of dead people though, there are strange people like Lettie, her mother Ginnie, and grandmother Old Mrs. Hempstock, who seem to know things they couldn’t possibly know. They’re older than humanly feasible; one is old enough to know when the moon was formed. And they have special abilities to manipulate time, memories, and instances. This is something the unnamed narrator will discover after he takes one weird walk in the woods with Lettie, where they discover a humongous tent-like being floating under an orange sky. The tent (Ursula) has intentions of turning their world upside down, and starts by gaining entrance to their world through a wormhole in the boy’s foot. And so it goes. It’s the beginning of a bizarre tale. This was a book club selection and one of my sisters who read it first was taken aback by ethereal story. She was blindsided. She (we) didn’t know that it was a book about supernatural events and she didn’t quite like or get it. Even though she knew the author wrote the eerie kids’ movie, Coraline, she didn’t know this adult book would follow that mystic path. Now she knows, and she’s not thrilled. When I read the book I had been pre-warned about its weirdness. Forewarned is forearmed. I went into the book knowing to expect the unexpected and my experience was much more rewarding. I’ve seen so many 4-5 star ratings on the book, I thought if so many people enjoyed it, it has to be worth a try. It’s certainly a fast read, so there wasn’t too much time wasted even if I hated it. But hate is a very strong word. So is love. I ended up liking it, not loving it, not enthusiastic fondness, just like. As I mentioned this was a book club selection and the other members thought the description on the back cover was deceptive in that it never mentioned any supernatural events. The votes came in: one thought it was really good, one thought it was pretty good, one thought it was goodish, the others thought....whew that was weird. But all agreed that it was fast-paced, the writing was excellent, and it wasn't overly descriptive or dry. If a dark, other-worldly adventure is not your idea of a good time, you might want to wander down some other lane. If you’re open for something new and mind-boggling, stroll down to The Ocean at the End of the Lane.